While my first year being a published author has been going great guns in the UK, things have got off to a fairly quiet start in the USA. That’s pretty much par for the course for a debut British novel, I’m told, and The Night Rainbow hasn’t done too badly. Considering there was no ‘launch campaign’ as such, around release time in April there was some great coverage in book shops, and I’ve had a modest royalty cheque, so hurray! 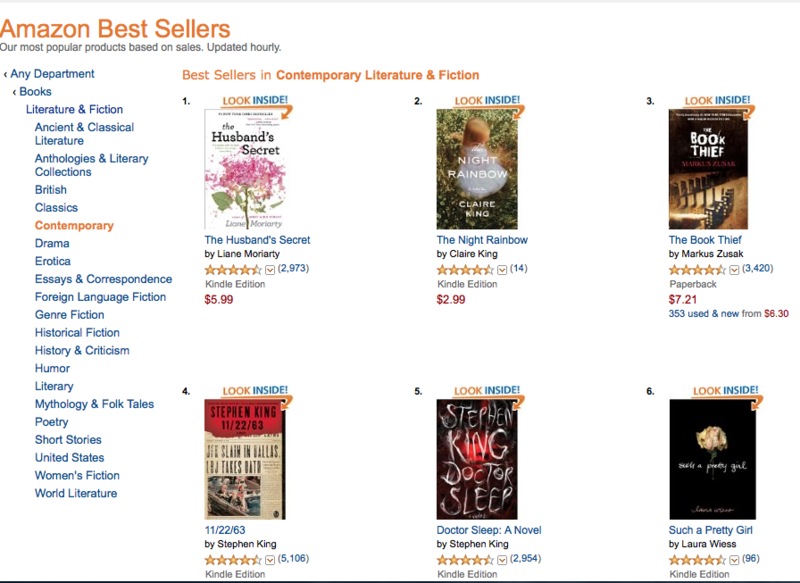 Then this week, Amazon.com chose The Night Rainbow for their Kindle Daily Deal. I don’t know how that works, but I am thrilled they did. a) Frankly, I can’t actually affect them. b) The numbers swing wildly about and it’s pretty unfathomable how they relate to actual books sold. c) They change every hour. Can you imagine how distracting that would be to a writer if you let it? But yesterday I made an exception, because I was interested in how the promotion – which saw the ebook price fall from around €9 to $2.99 for 24 hours – would go. Looking over the months since launch, sales on Amazon of both the printed and the e-book appear to have been close to non-existent. Yesterday my sales ranking in the Kindle Store shot up by 954,681% (apparently*). From roughly #250,000 to #25 in the paid kindle store. That’s pretty close to the top of the list. I don’t know what my sales were for the day exactly (they certainly didn’t increase by a million percent) but they did shoot up quite remarkably and continued for a while after the Deal had finished, when the ebook was back to full price. The Daily Deal was November 26th 2013, so if you’re interested in seeing how the ebook is ranking now, click here. I also followed the ‘noise’ around the promotion. And it’s not just Amazon who market it. They publicise the deal onsite and send out emails to Kindle users, but I also noticed that on twitter and on the web in general there are lots of accounts set up to catch these deals and shout them out to their followers and readers, magnifying the effect. *It was one of those accounts that tweeting the amazing 954,681% leap in ranking. It’s a machine that works very effectively. Well, yes. So to the thorny question of Amazon. As a reader, I’m a bookshop girl. I love bookshops. I love choosing books in bookshops and chatting to people who work there. As an author I also love bookshops. I love the warm welcome you get from the dedicated, passionate independent booksellers and from their customers, who they often know by name. But Amazon have about a 30% market share of books in the USA. Many people now go straight to Amazon when they want to buy a book, and an even greater percentage when they want to buy an ebook. And obviously book shops don’t sell ebooks for Kindle (although Amazon are offering them the chance, which is a whole other debate). Some people do prefer reading books electronically and the people that took a chance on my book yesterday because of a promotional price point and a big shout out from Amazon are not people who would have bought a paper copy from a book shop. Otherwise they’d have done it sometime in the last 7 months, I’d have thought. They are, however, people who will read it, hopefully be delighted by it, and hopefully tell that to other people. Sometimes, as authors, it’s suggested that when we ‘self-promote’ we should limit that to encouraging people to go to bookshops. When the question of Amazon, or indeed supermarkets, comes up, even if they’ve helped market and sell actual quantities of our work, we are expected to hum and ha and shuffle our feet nervously. I did tweet several times yesterday to let people know about the offer. And every time I did, I must admit I felt worried that people might judge me for inadvertently ‘supporting’ Amazon. But in the end, is it we authors who are responsible for the struggles that bookshops face? I don’t think so. Most authors I know would happily do signings at bookshops, support library reading groups etc., even if they find public appearances rather painful (the authors not the reading groups). Nor are we responsible for where readers choose to shop. We have excruciatingly little influence, quite frankly, over who buys our book and from where. We can tweet our little hearts out, but unless we seriously set about a time-consuming social media campaign, it’s just not our call. The greatest influence we have is in the quality of our writing. So, if a retailer stocks our books and readers buy them, enabling us to feed our kids and write more books, then we are happy. And if we can give that income a little boost along the way, then generally we will, as best we can. Yesterday’s Amazon promotion was a great opportunity to boost awareness of The Night Rainbow in the USA and Canada. It’s the kind of novel that thrives on word of mouth recommendations, and as many authors can tell you, it can be frustratingly difficult to kick those off. I hope the people who picked up the e-book for $2.99 yesterday will love it, and that they’ll consider giving it as a gift (wherever they choose to buy it) or just tell others what they thought. And also that they will want to buy the next book. Speaking of which I’m off to finish it. Hopefully there’ll be news on that soon. I will never buy another physical item from Amazon, after seeing a very recent BBC program that looked how the staff have to work. It was horrendeous. The only thing I will buy from them now is ebooks, but I only do that occasionally since I don’t own an ereader, but have had one or two on my kindle for pc app from friends who are indie writers. Thanks for your comment Paulette. I heard about that program and it sounds awful. The other issues that are often raised are about where tax is payed, and their leverage over publishers. Personally I try to buy as much as possible from small local businesses, and this included books, meat, fruit and vegetables etc. As consumers we are responsible for making the right decisions, because otherwise, what we allow is what will continue. As an author, the question is different, I feel. Sums up my ambivalence about Amazon. I love bookshops and hate to think they might disappear, and I hate Amazon’s power/stranglehold on the market. 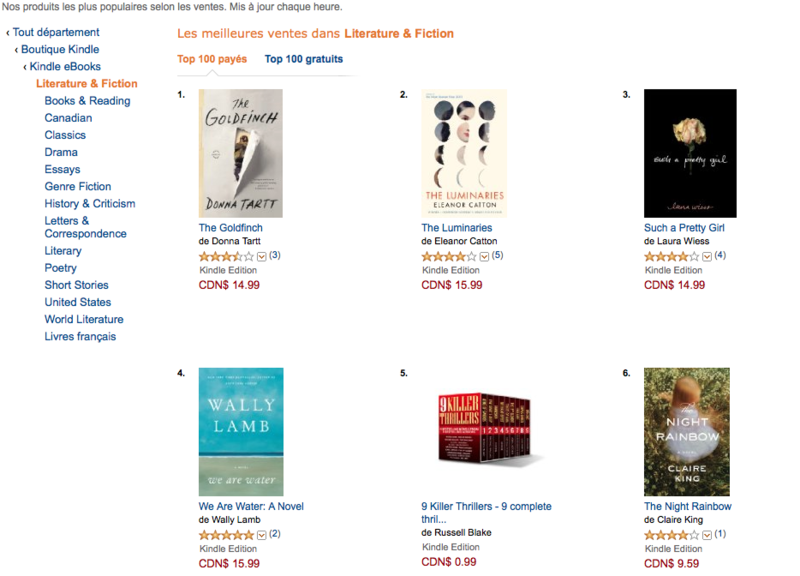 As an author, I also loathe the whole rankings stuff. But as an author, I can’t afford to ignore Amazon. What to do? Thanks Lindsay. I think as an author we work with the market we have. 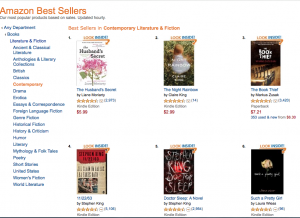 There are a lot of issues in the market that authors have to face, and not all of them come from Amazon. i’m ambivalent as well, Claire. As a new writer of fiction yet to find a ‘proper’ publisher, at the age of nearly 81 and writing my 3rd novel in 3 years I’m unlikely to get any sort of recognition if I don’t use Amazon. For years I was a writer of best-selling French textbooks being exploited by a giant publisher. As soon as technology allowed, I started my own publishing business, after which I sold fewer books but made more money, and generally I sold directly to schools. But when Amazon came on the scene I realised that I needed them, but they insisted on a 60% discount, which meant I had to increase my prices to avoid making a loss on every book I sold! I then had to mail all my school customers offering them a 25% discount on the Amazon cover price! Frankly, I resented being forced into what I considered a less-than-honest pricing policy. What I don’t resent is whatever success you achieve as a result of your Amazon promotion, because, as you know, I think The Night Rainbow’s a wonderful book. Thanks Tony. One of the reasons I love having a publisher is that all the big commercial dealings with retailers go through them. I’ve dealt with big retailers professionally in previous jobs, and I know the game. It’s not one I want to play and I’m thankful that someone else will take care of that on my behalf. I’m a very small fish in a very big sea, and mostly what I want to do is swim. It’s so much easier for readers to boycott Amazon than it is for writers: you owe it to yourself and your book to do your best to get it out there somehow and these people certainly know how to deliver. We all face ethical challenges constantly (even the fact that I’m using a computer to connect with your website) and sometimes the best we can do is muddle through, take a stance where we can and at least be aware of our collusion where we can’t. That’s modern life – virtually impossible to opt out completely. Thanks, Anne, for your understanding and considered comment. “It’s so much easier for readers to boycott Amazon than it is for writers” – Absolutely, Annecdotist. Although, even when you think you’ve found an alternative, you’re never entirely sure (for instance, ABE Books being owned by Amazon). Disgusting that they’d get the Welsh government to pay them to set up shop, then not pay tax and abuse their workforce. As someone who is attempting to get back into writing, I am so pleased I accidentally found and read your commentary here. I was trying to decide between smashwords or possibly going through amazon. Reading this convinced me that sticking with smashwords would be the right thing to do. What a fascinating debate you’ve sparked, Claire! I think every writer has to weigh and make their own decisions. Kelli likes Smashwords, but for me, Amazon are so much better geared up to supporting self-published eBookers and, like it or not, have the market volume. It’s also nigh on impossible to be sure that a company is truly whiter than white in such a global economy. In the end, I have to do the best for my books. Thanks Dave, and Kelli. It’s interesting to also see the point of view from authors who are self-publishing, which is a whole other dimension. As you know from my occasional blogs on the subject, I’m not a fan and do anything I can to buy elsewhere. There are so many fantastic bookshops and booksellers out there who do so much more for authors and readers other than just flog books in the same manner that they sell cheap plastic crap from China. Amazon is an important part of the market (I’m in anthologies which are only published on Amazon) but I find it really disappointing when published authors and some publishers ONLY automatically link to the Amazon site and act as if no other booksellers existed, no one else has an online ordering system or can send out books by post and there is no other way of buying an ebook. It’s just as easy to link to another website as it is to Amazon so why do Amazon’s promotion for them? Yes, fully agree, I don’t know how a single link to Amazon has become the default for a lot of people. It seems to assume that’s the retailer of choice – perhaps because there’s a belief that people are more likely to purchase from a familiar site (I bet the number of people who have used Amazon at least once is very high)? But how many people actually click through on these links and buy from them? I don’t know, but I’m not convinced that they’re that effective. I still think an author’s ultimate best friend is word of mouth. I would love to have a book published one day but for now I’m mostly a blogger and an avid reader. I have read over fifty books this year on the kindle compared to last year (before I got my Kindle) when I read about five, so the Kindle has made a massive difference to my reading! I do have mixed feelings about it as I love the feel of a ‘proper’ book and I want to support bookshops, but I’ve been able to buy so many books so cheaply on the kindle (I usually buy them when they are £2.99 and under, or on the kindle daily deal etc) and then read them in the dark while feeding my baby! I read The Night Rainbow about a month ago and LOVED it. I read it based on Amazon recommendations on the Kindle (‘other readers who bought this also bought that…’) and I’m not sure I would necessarily have found it in a bookshop. I have since recommended it to friends and intend to buy a hard copy as a christmas present for my mum! I like to support my local bookshop so have taken to buying hard copies of books I have read on the kindle, as presents for people, or for myself if I like them enough. All this is a (rather long – winded!) way of saying that I think there is a place for e-books and Amazon alongside bookshops as it helps give readers access to a wider range of books more cheaply and easily. But I worry about Amazon’s morals and I would hate to think of bookshops becoming a thing of the past! It is an interesting debate!